Hamentashen are the kind of cookies that are easy to make gluten free. It's a rolled cookie dough that doesn't have to be fluffy, or rise, and because there's no gluten in the dough, it's hard to overmix. That being said, I'm posting my gluten free hamantashen recipe because I like the way this one tastes (very sweet). Fillings: fig butter, apricot preserves, Solo brand fruit fillings are traditional. Cream sugar and margarine. Add eggs one at a time and vanilla. Add flour with salt and xanthan gum. 4 cups is approximate and depends on your flour type. 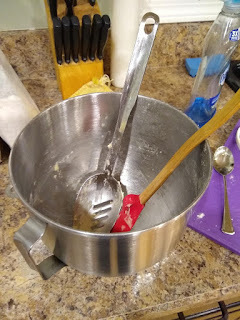 If you're using a stand mixture, add flour until it lumps up and starts banging against the bowl. Place in 2 plastic bags, and store in refrigerator, unless you're in a hurry and you can try the freezer, but I always forget it there and then it's too hard. Let the dough sit in the refrigerator/freezer half an hour. Or an hour and a half. Roll out thin (quarter inch). I always always roll onto wax paper that I've floured with gluten free flour. Use a round biscuit cutter/ or drinking glass. Place on greased cookie sheet. Add a little less than a teaspoon of filling to the center of each cookie round, and pinch it up into a triangle. If your filling is fig butter (currently available at Trader Joe's), you've created a fig newtentashen. Delicious!! Bake for 15 minutes. They should start to look a little brown, unless you're using the kind of gluten free flour that doesn't brown up. Remove from cookie sheets to cool thoroughly, and then freeze until Purim. This recipe makes around 4 dozen cookies. *This year I tried Mama's Almond Blend flour. It didn't roll very well in this specific case (love it for other recipes), and for this one, you're probably better off with Rice Flour/Tapioca Starch/Potato Starch/Xanthan gum (such as here). Pillsbury flour and Mama's flour bad; King Arthur gf flour worked great.